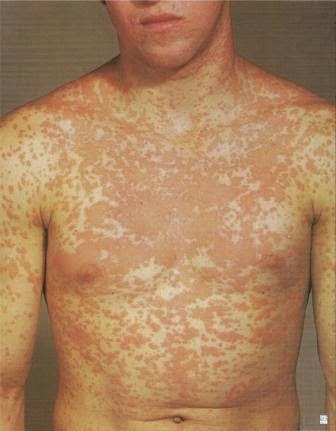 The term "morbilliform" is used to describe any skin finding that resembles the measles rash. The macular lesions are typically diffuse, red and 2-10 mm in diameter. They may become confluent (come together to form clusters) in some areas. It is very important for doctors to know the differential diagnosis for a morbilliform rash, since some of the conditions are deadly. The process occurring within the body leading up to the rash, known as the prodrome, will help the physician narrow the diagnosis.This prodrome can be learned by ascertaining a good history. A study by Ramsay et al in 2002 evaluated the laboratory samples of 93 vaccinated children in England, and noted that the most common cause of the rash was a parvovirus B19 infection (17%). Group A strep was found in 15% of cases, and sixth disease (roseola infantum or herpesvirus 6) in 11%. None of the cases were caused by measles. The use of widespread vaccination has nearly eliminated the measles infection, making way for other viruses that cause similar rashes. It is paramount that physicians discern the cause of the findings. Ramsay M, Reacher M, O'Flynn C, Buttery R, Hadden F, Cohen B, Knowles W, Wreghitt T, Brown D. Causes of morbilliform rash in a highly immunised English population. Arch Dis Child. 2002 Sep;87(3):202-6.